Congratulations to Sandra. G, Mary P., Cindy W., Sandie W. and Kai, the winners in Cathy's giveaway. Thank you to all who participated! I’ve been thinking about new beginnings a lot lately. Working through The Artist’s Way, I’m seeing new possibilities and approaches to creativity. And new “tangibles” have arrived—a new book, new publisher, new readers. A new beginning appeals to us. A clean slate. No baggage dragging us down. A fresh chance to “get it right.” So often with romance, when we mention a new beginning, we think about the thrill of a new relationship, the heart-stopping excitement of connecting with someone new. But what about the depth of an existing relationship? The years of shared experiences and ties that transcend mere attraction? 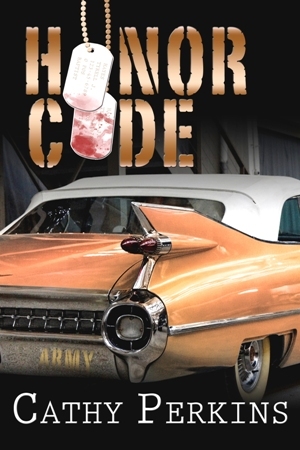 In my recently released novella, Honor Code, Detective Larry Robbins tries to create a new beginning for his marriage. After twenty years, the kids are grown and launching into their own lives. Larry and Sharon wrestle with a new stage in their relationship, redefining roles and expectations. This theme appealed to me as my children launch into their adult lives and my husband and I refocus our relationship—on each other. This mature love allows for a deeper intimacy—and the best kinds of romance! As a set up to the excerpt below, Larry Robbins has been working long hours, deeply involved with yet another case. The old man he’s trying to find has a sixty-year marriage which by all accounts was filled with love. Larry tries not to be envious of their bond and initially blames his wife for the tension in his relationship. But during the investigation, a wise old woman reminds him it takes two to create friction—or a good relationship. So, earlier in the afternoon, Larry has tried to think of things that will make his wife happy and improve his home life. What have you done recently to improve your current relationship? Robbins stopped at Grunder’s Café—Sharon’s favorite restaurant. He picked up the to-go dinners he’d ordered earlier that day and placed them on the back seat where they wouldn’t get knocked over. He caught himself smiling and humming a line from some song as he threaded through back streets and cut over past the cemetery. The smile left his face as the graffiti-tagged wall mocked him. Robbins glared at the offending bricks. People were upset about the vandalism. Spray paint anywhere was a nuisance. Spray painting a cemetery—that was just low. He hoped the judge’s sentence for the offender—and they would catch whoever did this—included scrubbing the wall clean. Another few turns and he entered his neighborhood, trying to recapture the good mood he started home with. Surprises for his wife. She’d be happy. He might even get lucky. He pulled into his driveway. The yard guy had done a good job, he noticed. The guy even edged the drive and sidewalk. A smile turned up the corners of his mouth. His plan was coming together. Sharon was home from work—her car was in the garage—but it was too early for her to have started dinner. He was transferring the meals to plates when Sharon walked into kitchen. Sharon looked at him for a long silent spell. Long enough that he nearly started to sweat. “I miss the kids. A lot.” She dropped her gaze and he hoped she wouldn’t start crying. This wasn’t how he’d envisioned the evening working out. This was more like it. He wrapped his arms around her waist, took a deep breath, and inhaled her perfume, her body scent. Cathy Perkins is a member of Sisters in Crime, Romance Writers of America and International Thriller Writers. She writes predominantly financial-based mysteries but enjoys exploring the relationship aspect of her characters' lives. Her suspense writing lurks behind a financial day-job, where she learned firsthand the camouflaged, hide in plain sight, skills employed by her villains. Giveaway ends 11:59pm EST Feb. 22nd. Please supply your email in the post. You may use spaces or full text for security. (ex. jsmith at gmail dot com) If you do not wish to supply your email, or have trouble posting, please email maureen@justromanticsuspense.com with a subject title of JRS GIVEAWAY to be entered in the current giveaway. We love connecting with readers here! Focusing on your partner is a key ingredient, isn't it? Glad you've made the transition! Shhh, don't tell but when we first got married (a looooong time ago!) the biggest transition for me was having someone around 24/7. I can see, especially if your husband was deployed periodically, that 24/7 would be a 'new reality'! It looks like an exciting story. We have been doing more things together as our children have grown and started to plan for what we will do when they leave. Great that you're thinking ahead and planning for a new phase of your relationship! Honor Code sounds really goo and look forward to reading it. My husband recently lost his job, so I've been trying to be more supportive, making sure I don't 'nag', and giving extra cuddles. I have to try to be more creative in doing things together that don't cost a lot of money - not easy. It is really difficult to find a new job when you're older. That's awesome you're being supportive in something that must be so difficult for both of you! Low or no cost ideas of things to do together. Hmm... maybe a post where we brainstorm activities? For my hubby and me, sometimes it's as simple as walking the dogs together in the evening and chatting about the day, but our small town has free concerts in the summer, fireworks over the river at the usual holidays and presentations at the local colleges. Maybe there's something similar in your town? Were the cookies in honor of my birthday or something you do with your partner? I have been trying to learn to be patience. I have been rushing in to a lot of things that I didn't pay attention to my boyfriend and my family. I need to relearn what being patience is about. That sounds like a great plan Kai! Nothing new, or even interesting, on the relationship front. That's just wrong. LOL - clearly someone's missing out on an amazing relationship with you! DH and u have been married 31 years and we still have date night. Oh, date night is so important in any relationship! I meant to add, especially if you have children! Happy birthday, Cathy! As for what I've done lately, I've endured some of his guy TV programs so we can spend some more time together. Bed and Breakfast in Charleston. Enough said! Oooh, Cathy, what a tough question, and HAPPY HAPPY Birthday. I'm in the same boat as you are I'm afraid. My husband loves to take trips, so I'm trying to be more open to sitting in a car and visiting -- not my favorite thing road trips. But ya know it's the place we do our best visiting. I own Honor Code. It's in my TBR pile. So excited about fabulous news of late! Enjoy! But talking (or listening while I read manuscripts aloud) makes that a great time together. Hi, Cathy! and congratulations on Honor Code. For Valentine's, Handsome gave me a letter. He wrote and mailed it. In it, he'd written all kinds of really nice things and I got all squishy. It has sat on my desk ever since for me to reread and know he is Mr. Special Handsome. I'm too late for the contest, so I bought Honor Code for myself! My four 'children' range in age from 16 to 21, and are still all at home, considering we live in just outside a city small city with both a college and university, so no empty-nest syndrome for me just yet. But this past Valentine's, I decided to shake things up. I brought home the bouquet of flowers and card, and took my husband out for dinner the day before. He was pleasantly shocked, to say the least. All the pressure shouldn't be put on just the men on that holiday!